HostPapa is proud to offer 24/7/365 customer support via phone, email, and live chat. 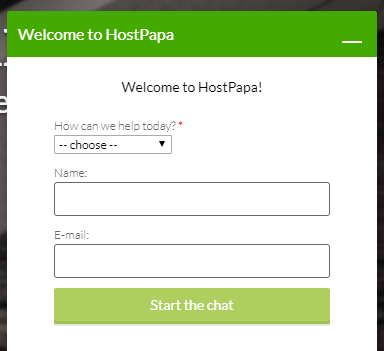 You can contact the HostPapa support team even if you don’t have your client ID at hand or if you don’t have a HostPapa account yet. Go to any page on HostPapa site and click on Chat now on the bottom right side of the page to open the chat box. Choose the type of inquiry you have: a Sales Question or Technical Support. Type in your name and email, and start chatting with a member of our team. You can also open the chat box by clicking on the CHAT menu at the top of the page. Call us 24/7 at (905) 315-3455 and 1-888-959-PAPA . You can email us at sales@hostpapasupport.com for any questions or clarifications.